On Tuesday 20 June Mary Robinson and Joyce Banda, the former President of Malawi, took part in the opening plenary of the InterAction Forum in Washington DC. The Forum brings together over 1,000 participants representing nongovernmental organisations (NGOs), governments, the philanthropic community, corporations, and civil society. This year, the Forum title was United We Stand; acknowledgement that, in a time of uncertainty in development assistance, shrinking civil society space and increasing pressures on multilateralism, a new unity is required between those seeking to ensure a fairer and safer world for all. Keynote speaker and former US President Bill Clinton focused on the theme of global interdependence in his opening speech. “The number one job of every one on earth is to increase the positive and reduce the negatives of interdependence” he said, “and it starts with how our minds work. We can either view the world as us and them or find a thread in us that allows us to see and feel the possibility of sharing the future”. During their discussion, Mary Robinson and Joyce Banda spoke about the importance of multilateralism and the traits of good leadership. President Banda called for leaders that are courageous and fearless, and govern in a manner that is accountable, transparent and inclusive. Speaking about the recent move by the US administration to withdraw from the Paris Agreement, President Banda said that the attitude of the US administration to climate change represented a lost opportunity for climate justice. “For those suffering the worst impacts of climate change, the Paris Agreement is our hope,” she said. Mary Robinson struck an optimistic tone to the same issue saying “The great news is the dynamic response to the US pulling out of the ParisAgreement. Businesses, State Governments and civil society groups have come out strongly to indicate that they intend to stay the course with the Paris Agreement”. She highlighted the open letter sent by a group called “We Are Still In”, a coalition of US based companies, investors, mayors and governors that have joined forces to continue to support climate action to meet the Paris Agreement. When asked about the challenge of carrying out action on sustainable development at a time when multilateralism and civil society space is under pressure, Mary Robinson highlighted that the Sustainable Development Goals and the Paris Agreement are not top down initiative, but rather consensual agendas negotiated and agreed by over 190 countries. “These are shared agendas” she said, “but developing countries need help to do what needs to be done”. Mary. Robinson said that developing countries are being asked to achieve a new development paradigm which was not done in the US or Europe – to develop without emissions. “It is in everyone’s interest that they are enabled to” shesaid. InterAction is an alliance organization in Washington, D.C. of over 180 NGOs working with the world’s poor and vulnerable. Their annual Forum is a three day event, held at the Walter E. Washington Convention Center in Washington D.C. and includes breakout sessions, high-level plenary sessions, and an awards banquet. 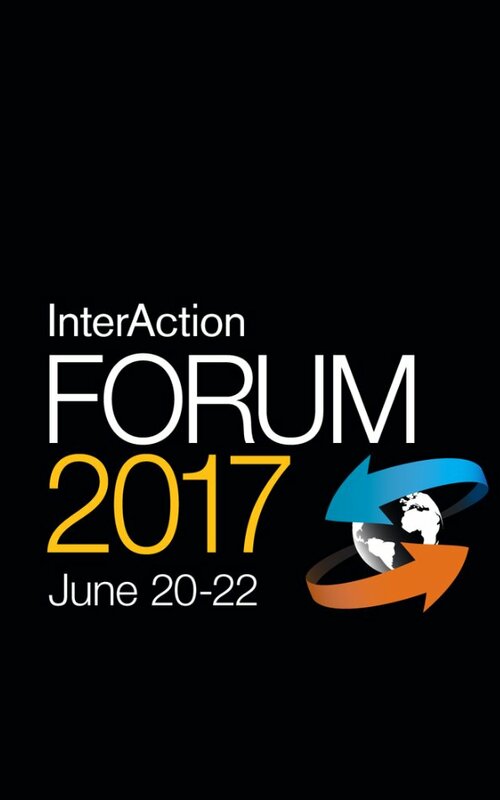 For more information on the Forum visit www.interaction.org.